The investment I made a year ago on Tiffany paid off. I partially reconsidered my bullish thesis on the basis of the second part of 2018. Tiffany is still a long-term value play and a buy-out target, but there are better options right now, namely Prada S.p.A. I sold two thirds of my Tiffany’s shares and bought Prada’s ADRs with the proceeds. 4. My fiancée’s love for Tiffany. In the last 12 months, Tiffany’s stock has been like a roller coaster, even worse than the broader equity market, reaching an all-time high of about $140 in July, only to free fall to a multi-year low of $74 during the last trading days of 2018. As we can see from the picture above, the return has been a fair 13%, slightly higher than the S&P 500 benchmark. I used the cash from the juicy dividend to buy the gift I already mentioned and I am now facing the common dilemma of every investor: should I buy more shares, sell or hold? The first half of last year was great, the best of many H1s in a row. 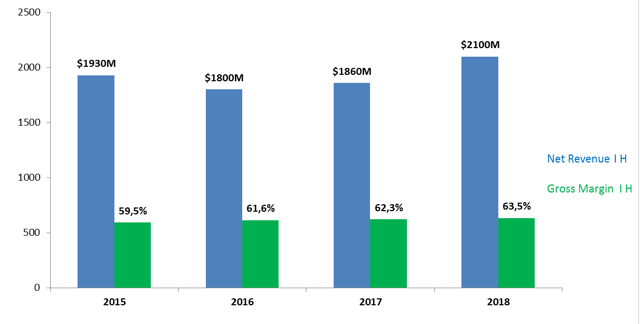 TIF managed to report an impressive YoY top line and gross margin growth, driven by new fancy commercial campaigns and new lines of jewelry. However, the second part didn’t deliver on the early promises, turning into quite a disappointing end-of-year and holiday season. Something went obviously wrong with Mr. Bogliolo’s strategy, who had previously called for more expenses to finance the new shape he envisioned for the company. In other words, investors had to expect a certain pressure on margins, but could also count on a robust growth of the company’s top line. Instead, that growth has almost vanished during the last six months. Mr. Market realized that and punished TIF accordingly. On the other hand, margins didn’t deteriorate as expected (EPS topped the increased 2018 guidance at $4.75 per share), which could suggest that management didn’t execute its strategy aggressively during the last fiscal year, perhaps due to excessive complacency on the better-than-expected first part of the year. Additionally, the slowing down of the company’s stock repurchase in the fourth quarter of 2018 is a red flag. In fact, Tiffany spent $421M in FY2018 to repurchase 3.5 million shares of its common stock at an average cost of $121 per share. 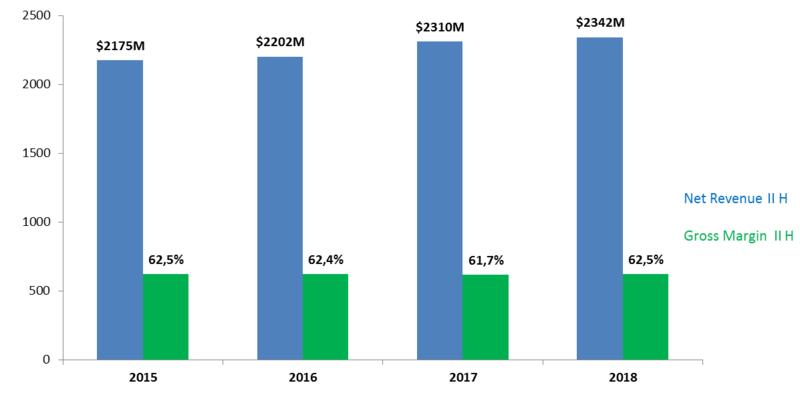 Yet in the fourth quarter, the company spent only $44M to repurchase 400,000 shares at an average cost of $102 (although there was authorization for another $635M under a program that will expire in 2022). It looks like the company also lost confidence in its own growth vision, isn’t it? A stronger US dollar also played a role in the second half of the year’s miss, as TIF’s results are dependent on a weak dollar, which usually encourages foreign tourists to purchase more goods in America. Indeed, Tiffany’s forex vulnerability is even greater than most companies, because more than 20% of its US sales come from tourists who usually compare how much its jewelry costs in their home currency terms. we expect sales in the first half to be adversely affected by several factors, a meaningful FX headwind, lower foreign tourist spending and a difficult comparison to strong base period comps. And we should not forget that the luxury items market, as a whole, suffered in the second part of the year. Fear of a looming recession, whether it was justified or not, put pressure on margins for all operators in this sector. In China, the headwind was particularly severe, as regulators started to fight against bad business practices, like cross-border trade (namely daigou), a grey market with an estimated value of $1T per year. Nevertheless, as far as the political environment is concerned, the positive news is the renewed commitment of the Chinese authorities to a light regulation (tax cut included) of the e-commerce sector. That will serve the company’s digital evolution well, with the enhancement of the Tiffany operated Chinese website. We are very excited about it. I would say hopefully for sales, but especially for giving visibility of the brand to Chinese customers that can learn more about the brand having a full-fledged website with products that can be purchased, so they can explore the assortment, learn more and then hopefully to buy maybe online and for sure in the stores. Overall, TIF’s management will keep on executing its strategy, as detailed in the last conference call, providing new products line, opening or restructuring new shops, releasing commercial campaigns and, of course, increasing its e-commerce operations. 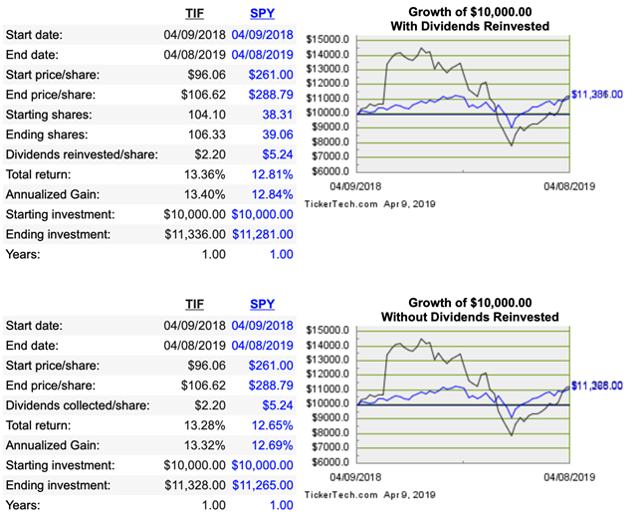 And yet, although I am still confident in the brand’s potential and in its growth strategy, I must confess I am less thrilled than I was a year ago about TIF’s perspectives. I believe that a stronger dollar and a shrinking megatrend for the jewelry market will considerably challenge the company in the long term. Nevertheless, the decline in the luxury market index, occurred in the second half of last year, provides better opportunities right now. This iconic Italian fashion company has been facing difficult years lately. 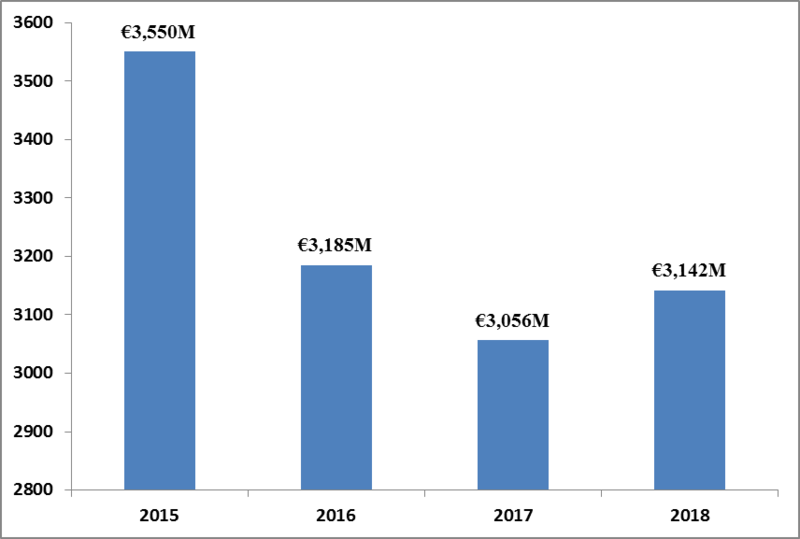 In 2015, revenue topped at €3.55B, just to crash by 10% in 2016. In 2017, Prada S.p.A. (OTCPK:PRDSY) set up a turnaround strategy to boost its sales through a reinforcement of its valuable brands and a full commitment to a digital organization. In 2017 and 2018, revenue stabilized and went on a new timid growth path. Prada’s net revenues for FY2018 reached €3.14 billion, up 6% year on year at constant exchange rates (3% under current exchange rates). Gross margin came in at 72%. Net income was €205M, to which we should add €80M-90M from a tax relief (Patent Box). During the last three years, the group has invested heavily in the renovation of its facilities and retail chain. Furthermore, in order to increase the brand value, it is gradually going to end all price cuts and will implement a new web-based omni-channel experience. In fact, in addition to its Chinese website, Prada has launched the new miumiu.com website in Europe, together with the new church.com and pasticceriamarchesi.com. A deep integration of the channels, also known as Pradasphere, will be pursued to provide easy access to the brand, telling the story behind products and events. The company has also been investing in the development of its data management and CRM initiatives, to address clients’ needs in a more integrated and effective way. These investments started to pay off. E-commerce continued to grow by strong double-digit in 2018 and even the wholesale developments were remarkable, with the e-tailers' sales contribution still growing despite the challenging comparative from 2017. Regardless of all the positive developments, Prada’s shares are traded at a very depressed level, near their all-time lows at less than $6 per share at the time of writing this. Initially, Mr. Market took the company’s digital transformation efforts very positively, pushing the stock up by over 100% from the 2016 low of $5.5. Then, it lost confidence in the second part of 2018, following the general market depression. As a consequence, today, Prada’s biggest markdown is set ironically on its stock price: the total cap of less than $8B barely accounts for the net tangible assets + brand value. The balance sheet is healthy, with a debt/equity ratio of 17% and current assets pairing with the company’s total liabilities. 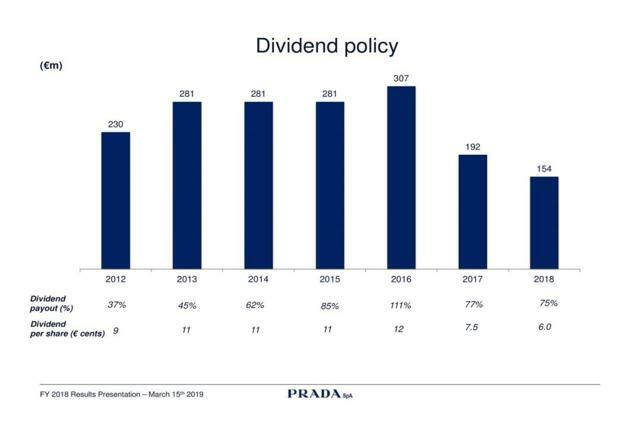 Prada‘s dividend has been reduced over the years, but at these prices, an annual 2% rate in the long run looks easily achievable (allowing me to buy some of its fancy purses, of course). All in all, the Prada bet today provides a limited downside and offers concrete chances of an important upside over the next years. 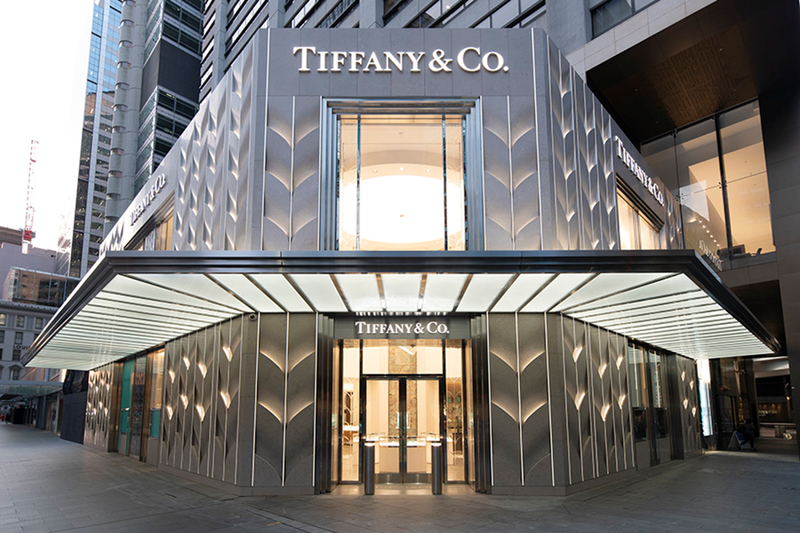 In comparison, the future returns of Tiffany’s investments appear much more limited. It was time to check the investment I made in Tiffany a year ago. 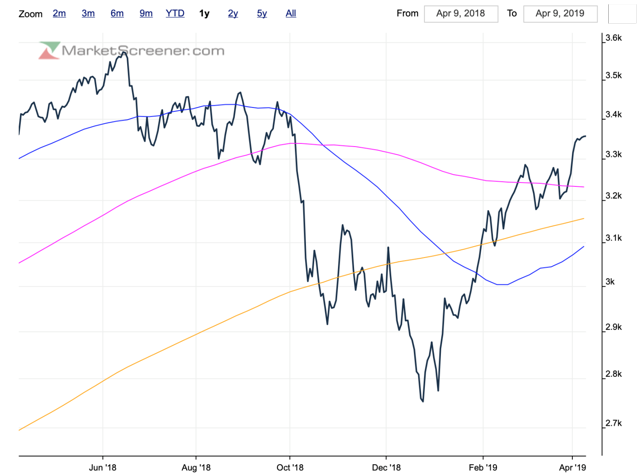 Overall, it performed decently, slightly beating the S&P 500 index in the period. Even if the long-term thesis still stands, the crash of the luxury goods market in the second half of last year created some compelling opportunities, like Prada. Thus, I decided to divert about two-thirds of the funds invested in TIF to this famous Italian fashion house. I believe the bet with Prada is more unbalanced than Tiffany’s. Consequently, I should have more odds for a better capital gain over the next three-five years. From these prices, I assign to Prada a downside of around 10% versus a downside for Tiffany of around 15%. The upside for Prada will be in the triple-digits, whereas for Tiffany it looks like it will be more around 60-70% from the current valuation. Disclosure: I am/we are long TIF, PRDSY. I wrote this article myself, and it expresses my own opinions. I am not receiving compensation for it (other than from Seeking Alpha). I have no business relationship with any company whose stock is mentioned in this article.